After the Rumble in the Marble, most Servants take a step back and assess the situation. 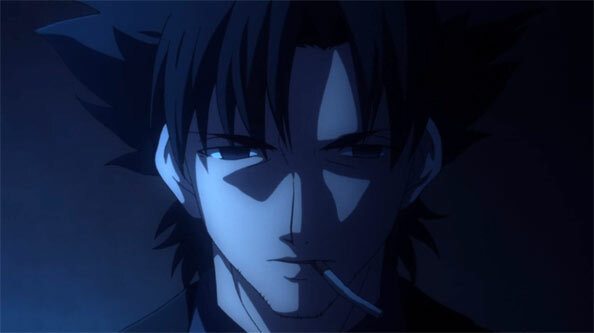 Kiritsugu sits in a dark hotel room and pores over intel as he chats with Maiya on the phone…and that’s about it, really. 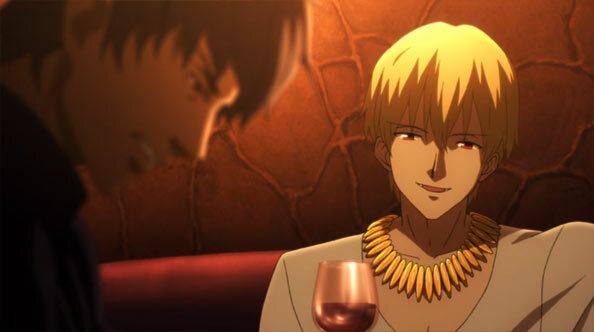 Reports and conversation are the name of the game again, but instead of interacting with Saber and Rider, Archer is stuck with Kirei, trying to connect the dots as part of his larger plan to make him one of his men. 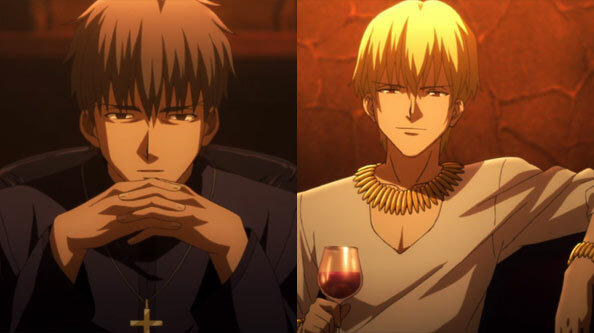 Kirei delivers his report on the motivations of the other Masters to Archer, who points out that the one that seems to interest Kirei the most is Matou Kiriya, who also seems to be enduring the most pain and suffering. Pain doesn’t seem to be an issue for Iri, while Saber doesn’t seem to be feeling the lasting effects from her throughout putting-down she endured at the hands of Rider and Archer. 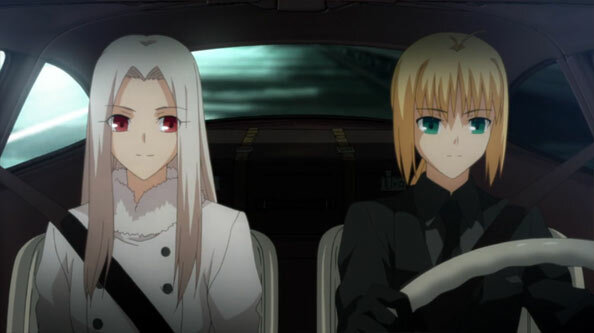 But Saber does find it odd that Iri has her drive and perform every other task that requires the use of her hands. When she asks Iri about it, she reveals she’s become extremely physically weak as a result of shutting down her sense of touch (a homonculus ability, apparently). While she believes she can recover a bit of strength by sitting in the right kind of magical circle, the bottom line is that she’ll be relying on Saber more and more as this War progresses. Saber, obviously, is up to it. I must say I underestimated her mental toughness. That circle is drawn in a storeroom on a Japanese mansion that looks very much like the place where Emiya and Saber live and practice in UBW. From there it’s back to Archer gradually wrapping Kirei around his finger, Emporer Palpatine-style. He gets Kirei to pretty much admit that he is actually capable of joy, and even if he’s previously considered such feelings to be a sin, Gilgamesh isn’t a fan of this newfangled puritanical philosophy that generated people like Kirei and Saber. Joy is joy, and leads to happiness. So Archer gets Kirei to ‘find his bliss’, and Command Seals suddenly reappear on his hand. Archer believes it’s proof the Holy Grail isn’t done with him; indeed it’s almost as if the Holy Grail rejected his previous role as Toosaka’s ally and spy and reinstates him as a full Master. Archer also suggests Kirei go out and steal a new Servant, and not-so-subtly picks up the Archer piece from the chessboard to indicate who he should pick. While there were some nice character beats, you can really only portray two people sitting around talking for so long from so many angles before it gets a bit tedious. In other words, another cool-down episode on the heels of a solid 10. That leaves one episode left in the first cour. Iris detects the massive mana of Rider heading towards the castle, and Saber suits up for a battle…only for Rider to show up in his t-shirt and pants with a giant barrel of wine. He’s not there to fight, he’s there to drink and talk. A Holy Grail “dialogue”, as he puts it. Saber has no objection, and drinks from the barrel with Rider. Soon, Archer also arrives, on Rider’s invitation, and after rejecting Rider’s “swill” opens a portal to his treasury to draw out…a golden jug and three golden cups. This would be absurd if it wasn’t also frikking brilliant, for Iskandar and Gilgamesh share one thing in common: they are hedonistic tyrants of yore. Gilgamesh is such a tyrant he considers all treasures in the world to be his, since they all sprang from his treasury—a treasury so vast he isn’t even aware of all it contained. Iskandar wants to be reincarnated as a flesh-and-blood man to take up his world conquest anew. Saber…wants to save Britain, in part by erasing all of the perceived mistakes she made in life as king. She wants a redo. Archer laughs in her face at the fact she harbors regret for the deeds in her life, and Rider can’t help but agree. As far as they’re concerned, it’s the duty of the nation and its people to serve and sacrifice for their ruler, not the other way ’round as Saber would have it. 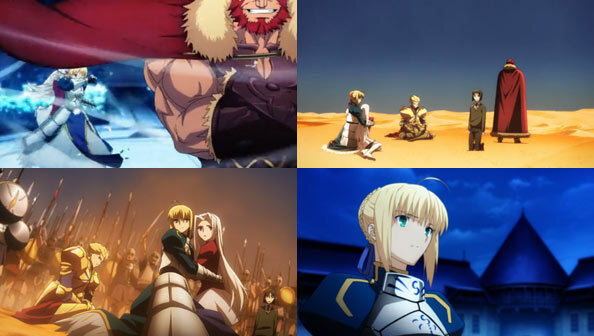 By insisting upon being a “slave to what’s right”, Saber might be able to save Britain, but she can never lead it, and so Rider ceases to see Saber as a real king. Kingship, to him, has always been a wondrous gift, and throughout his rule he lived and fought as grandly and greedily as possible, living life to the extremes of both good and bad, that he might inspire men to fight and die for him. When Assassins surround them (a test by Kirei and Tokiomi), Rider transports everyone into a Reality Marble. There, in the vast desert sands, Iskandar’s endless armies march, and when he mounts his trusty horse and orders them to advance, the Assassins are quickly routed. Saber, Iri and Waver can only sit and watch in stunned awe, while Archer does his best to look unimpressed. It’s the biggest spectacle since the port battle, and it is well and truly momentous. When the battle is over and everyone’s back in the courtyard, Rider takes one more drink, then takes his leave, which is just as well, as I don’t think anyone’s ideals could have been shat on as thoroughly and mercilessly as Saber’s (If I didn’t know better, I’d say Rider was a cruel drunk). Archer remains to mock Saber, urging her to go ahead and continue believing in her ‘backwards’ philosophy so he can laugh at her some more. 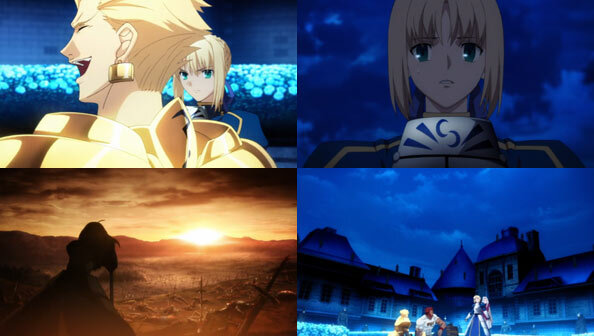 Their words cut as deeply as any blade, as Saber remembers one of her Knights of the Round Table stepping down because he didn’t think Arthur understood his people…and Rider and Archer’s words only served to reinforce her growing crisis of confidence. 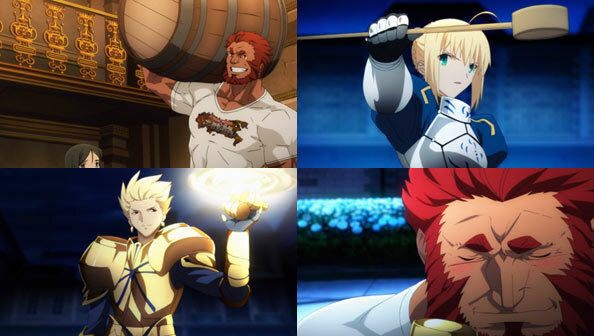 But while it doesn’t end well for Saber, like at all, it was fantastic to see three Servant Kings simply sitting in a courtyard, drinking wine, and shooting the breeze…and for Rider to show that he can back up all his big talk, and then some.